You authorize Fertile Heart to receive any account information from any affiliated merchant including, but not limited to, information regarding any purchase made by you through utilization of the Service, such as: the products ordered, the order number, the time and date of the purchase, the email address entered for the purchase. Fertile Heart does collect and track certain non-personally identifiable (non-PII) information, including but not limited to, user IP numbers and browser type, access times, domain names, usage habits and other information which does not specifically identify any individual. Fertile Heart may use or disclose PII to operate and manage the Service, to provide services that you have requested or respond to your other inquires or requests. We may also disclose PII in the establishment or exercise of legal rights or defense against legal claims, to comply with applicable laws or regulations, to comply with a valid legal process such as a search warrant, subpoena or court order or to investigate suspected fraud or a violation of the terms of the Fertile Heart Terms of Service. We will never sell your Personal Information to any third party not affiliated with Fertile Heart without your consent, except in connection with the sale or merger of Fertile Heart or the division responsible for such services. You should be aware that PII which you voluntarily include and transmit online, such as in online forums, may be viewed and used by anyone with access to such forums. Fertile Heart is unable to control such uses of your PII. Sometimes, users ask us to share their PPI information with third party individuals or companies. However, we cannot share information even if the user requests that we do so in writing. The security of your PII is very important to us and we take commercially reasonable steps to attempt to secure your PII. We have put in place reasonable physical, electronic, and managerial procedures to safeguard the information we collect. Only those employees and contractors who need access to your PII in order to perform their duties are authorized to have access. However, due to the inherent open nature of the Internet, we cannot guarantee that communications between you and Fertile Heart or information stored or transmitted through the Service or on our servers, will be completely free from unauthorized access by third parties such as hackers, and your use of the Service demonstrates your assumption of this risk. We give you the option to remove your PII from our list of active users completely in connection with the termination of your Fertile Heart.com user account. All unsubscribe or opt-out requests should be sent to us at http://www.fertileheart.com/contact-us/ and we will process your request within a reasonable time after receipt. We are not responsible for removing your PII from the lists of any third party who has previously been provided your information in accordance with this policy. 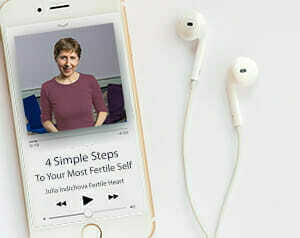 Use of this Service is subject to the Fertile Heart Terms of Service located at fertileheart.com. I raced through Julia’s excellent book, which was arresting in its honesty, candor and straight-forward telling of her incredible story. The book was full of excellent information, sometimes deceptively simple, but what I now know to have been the key to what later shifted the course of my life. I was extremely impressed with her emphasis on trusting your own resources and treating doctor’s advice as just guidance, and not the word of god.